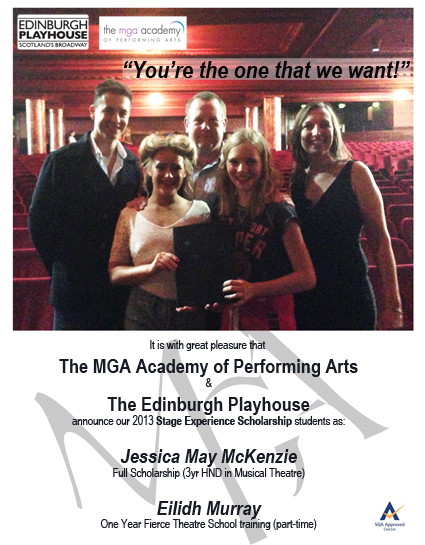 MGA and the Edinburgh Playhouse are thrilled to announce that for the third year in a row we have come together to offer two amazing Scholarships to two lucky Edinburgh Playhouse Stage Experience participants. A life changing evening for the two lucky winners. A full scholarship to attend our 3yr HND in Musical Theatre for one and a full scholarship to attend our part-time classes at The Fierce Theatre School! A huge THANK YOU to the entire management team at The Edinburgh Playhouse and ATG.